hat if there was a way for YOU to learn directly from the top high school coaches in the nation? Folks who've won multiple state championships and sent dozens of their players on to full ride scholarships. Wouldn't that be cool? You could learn all their most jealously guarded secrets for planning practices, motivating players, and building a top-notch program that's successful year after year. You could make photocopies from their playbooks, and discover their favorite "go-to" drills for shooting, passing , ballhandling, rebounding and defense. In short, you could discover all their winning strategies and techniques, then bring that knowledge back to your OWN gym to use with YOUR team. Can you imagine how quickly your basketball IQ would skyrocket? And how much better your kids would play? The Vault is the result of a four year project to compile the most treasured tips, tricks and insider secrets from the "front lines" of amateur basketball. Keep in mind, this is not some "Ivory Tower" professor's theory on what might work with a real team. Every Technique Comes From A Real-Life, Flesh and Blood, "In The Trenches" Coach Just Like You! Coaches who deal with the everyday stresses of parents, administrators and "day jobs." Just like you. Coaches who occasionally hold practice in a crappy gym with short-handed staff. Just like you. Coaches who aren't always blessed with Blue Chip talent, and have to work a little magic to stay competitive year after year. Just like you. Some of them coach boys. Some coach girls. Some of them come from tiny schools in the sticks… some from big city urban schools… and some from the 'burbs. Some of them have decades of basketball experience, and some are relatively new to the game. That's right. Each and every one of these coaches has taken their team to "State" -- and come home with the first place hardware. Some of them have done it multiple times in fact. So who are these coaches? The New York City Coach of the Year who's sent 14 athletes onto full scholarships in the past 3 seasons. Valuable Coaching Secrets To YOU! Each one of these 99 coaches was asked to share a small selection of their "go-to" tactics. 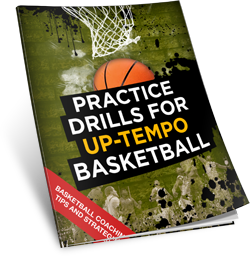 To take their most effective plays and drills -- ripped directly from their own personal coaching notebooks -- and break them down with simple instructions that ANYONE can understand. In the end, we had four complete volumes -- 407 pages of content in all -- jam packed with championship-PROVEN basketball coaching strategies! Here's a small sample of the specific techniques you'll learn. Each coach's section begins with a short bio and explanation of their coaching philosophy. From there, we'll dig into the nuts and bolts - detailed drill and play descriptions, complete with step by step diagrams and coaching tips. And remember, the entire package is broken down into bite-sized segments that are easy to digest, just like the sample above. So you can learn the material at YOUR own pace... on YOUR own schedule. And here's what makes this a total no-brainer. The entire package -- all 4 volumes chock full of championship proven drills and plays -- is presented in downloadable eBook format. No shipping and handling costs. No endless days waiting for your material to arrive in the mail. You can get cracking into The Vault tonight, and start using these strategies at your very next practice! As soon as your order is securely processed, we'll direct you into our members area, where you can download the files in PDF format. You can read through the material on your computer and print out the pages you want. Or, transfer the files to your eReader, smartphone, or tablet and bring it right to practice! This incredible compilation of drills, plays and coaching strategies is so unique, so rare, and so valuable, it's hard to put a real dollar figure on it. Let's say you had the personal connections to get in touch with all these State Champion coaches, and could somehow convince them to spill the beans and show you their most treasured basketball coaching secrets. How long would it take to pull all of it together? To locate and interview the coaches, copy down their instructions, create the diagrams, and organize it all in a simple way you could actually use? 100 hours? 200 hours? 500 hours? Even if you figure your time is only worth 10 bucks an hour, that's somewhere between $1,000 and $5,000 in real world value right there. Many of these coaches are fixtures on the national clinic circuit. You could go see them in person, take down notes like a banshee, then compile it all to create your own collection of championship-proven drills and plays. You'd probably need to attend 5-10 full clinics to get 407 pages of notes. Add up your clinic entry fees ($100 a pop), airfare, meals, and travel expenses, and you're easily talking $2,500 or more. So, when you really start to dig into it, charging two or three hundred bucks for this collection would actually be quite the bargain. But I'd never expect you to spend that kind of dough. Listen. I'm an amateur coach just like you. I know you don't have a secret stash of "basketball education funds" saved up for an investment like this. If you're lucky, you can beg and borrow a few bucks from your Athletic Department. Or, more likely, this is coming out of your own pocket. The 99 coaches who contributed to "The Vault" didn't do it for the money either. They were happy to share their basketball knowledge to benefit the next generation of coaches, and help more kids succeed in the game we all love. So for a limited time, I decided to set the price extremely low - just $97 $67 for the entire collection. Less than a decent pair of basketball sneakers. Click here to place your secure order now! 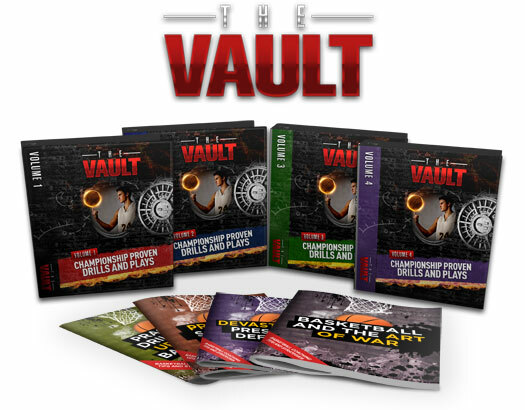 To celebrate the Internet release of The Vault, and reward coaches who take action TODAY, I'm going to throw in four additional bonus resources, valued at $96.90! Sun Tzu was a Chinese military leader who lived from 544 to 496 BC. His "Art of War" is probably the most important work on strategy and leadership ever written. And now, you can apply Sun Tzu's approach… on the basketball court! 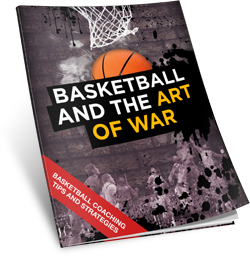 "Basketball and The Art of War" is a nine page mini-report that takes Sun Tzu's most important strategic principles and translates them into simple, straightforward tactics you can use with your basketball team. How to develop an "up-tempo" coaching philosophy that "unites the upper and lower ranks in purpose"
Discover the simple secrets to a high-scoring offensive system! This incredible report features 37 step by step offensive plays explained with clear instructions and detailed diagrams. Wing isolation: How to create high percentage scoring opportunities by isolating your 2 or 3-man from the wing position. Learn simple ways to get a wide open three, 1 on 1 clear out, pick and roll, or drive and kick! Low post isolation: Want to flex your power game? Discover four proven tactics to get your best low post scorer isolated on the block, including mid-gap baseline cut, strong post up, weak side flash, and drive and lob! Transition fast break: Learn five killer strategies for attacking the basket in transition, and getting great looks for your best scorers! Plus… the best zone offense to use… how to create great matchups for your point guard to exploit… out of bounds plays that really work… and a whole lot more! 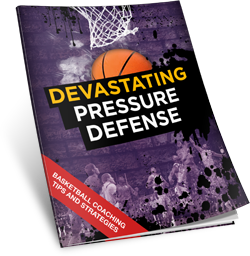 Devastating Pressure Defense is an 89 page report that shows you exactly how to install and execute 30 stunningly effective pressure defensive sets -- all explained with step by step instructions and detailed diagrams. 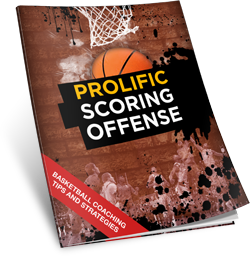 You'll learn 11 killer full court presses, plus 19 additional trapping sequences for your half court defense. So you can dominate your opponents with overwhelming ball pressure, traps, and pass denial! The best court locations to spring a trap. Do this right and you're almost guaranteed to force a turnover. How to use the press to create high possession games and score easy baskets. Scoring 100 points in a game will be "just another day at the office!" The 6 C's of Pressure Defense -- simple concepts to transform your team into an fearless defensive juggernaut! The exact body mechanics that create an overwhelming trap. Learn precisely where each player's hands, feet and torso should be placed to maximize the effectiveness of the trap, and give your kids the best chance for a steal! How to make a passing lane "appear" to look open - then time your break for a brilliant interception. Boom! Easy layup at the other end. How to position your defenders to snag every rebound. The best way to communicate your defensive set to your players and eliminate confusion. So you can seamlessly change defenses in a snap, without wasting a precious timeout! ATTENTION: You do NOT need "natural athletes" to become an aggressive, fast-paced team! This collection of 29 drills will help your team become masters of the up-tempo style of play, so you can play a more aggressive brand of defense, push the ball at every opportunity, and have more FUN on the court! These bonuses alone could easily sell for $96.90 together. But They're All Yours - Absolutely FREE - When You Purchase Your Copy Of The Vault Today! Ready to dive in? Here's what to do next! Click on the "Add to Cart" button below, fill out the secure form, and you'll get instant access to the ENTIRE package, all four volumes of The Vault, plus the four bonus reports for just $67! Click Here For Instant Access To The Vault! If you coach youth, high school or college athletes and you're serious about winning, then this is the resource you've been looking for. If your eyes light up when discovering cool new drills, plays, and strategies, The Vault will provide an immediate boost to you and your program. In fact, this package is chock full of so many useful ideas for coaches at ALL levels -- stuff you can use now AND in the future -- it may be the last coaching resource you ever buy! I know there's a ton of basketball info out there. And it's hard not to be a little skeptical when the next "big thing" comes around. So here's what I want to offer you. There's never been a package like this before with so much killer information from so many championship-proven coaches. That's just the truth. 200% Guarantee For 2 Full Months! That means you can order The Vault today, learn all the secrets, and use the drills and plays for 2 whole months. And if these strategies don't launch your team to the top of your league's standings… and you don't see an IMMEDIATE and DRAMATIC improvement in the way your kids play… simply send me an email, and you'll be rushed a complete and total refund of your purchase price. You Can Still Keep All The Material For Free! Crazy I know. But that's just how confident I am that this stuff will blow your mind and completely transform your team. We'll give you a complete refund, and you can STILL keep everything for absolutely no charge… the plays… the drills… the coaching tips… everything - and it won't cost you a penny. No questions asked. And no hard feelings, either - I insist we treat every customer the way I want to be treated when I buy something… and that means, simply, that the customer is always right. So get started with this package right away. I guarantee you'll be delighted with the improvements you'll see (and the respect you'll gain)… almost overnight. And if you're not… just let me know and I'll refund your payment right away, and you can still keep everything for free. Maybe you have a friend who might like it instead. Just don't give it to one of your opponents (trust me). Ordering is simple, just click the Add to Cart button below and you'll get access to everything in just a few seconds. But you must order now. Today in fact. There's no way I can continue to offer this 200% guarantee forever. (otherwise, some folks might take advantage of the situation, if you know what I mean). So don't lollygag and miss out. Your team is depending on you. Okay -- let's wrap this up. I've stated my case. Now it's up to you. Of course, you don’t have to order. You can choose not do anything at all. You can keep kicking those tires, putting it off until a "later" that will never arrive. Or, you can tell yourself, "I'm already a good coach getting good results. What could a group of State Champion basketball legends possibly have to teach me?" And if your goal is to be just another middling coach of another middling team… then that's fine with me. But if you truly want to compete with the top dogs in your league. If you want to make a name for yourself. If you want YOUR kids to reach their basketball potential and succeed at the highest levels, then you'd be silly not to give this a try. They won't stand pat and do nothing. In fact, I guarantee that some of them will take me up on this offer and start using these tactics against you and your kids this season. Don't get left behind. Click the Add to Cart button right now to secure your copy of The Vault now with no risk. That's 556 pages of championship proven plays and drills... ripped directly from the playbooks of our country's best coaches. A $256.70 value - easily. Much, much more if you consider the time, cost, and effort that went in to assembling this incredible collection. But you can have it all today for just $97 $67. Click here to crack The Vault right now, and learn the most treasured secrets of State Champion coaches! PPS - Don't forget... the entire clinic package is covered by an unprecedented 200% guarantee. Which means you can try out all these techniques for a full 60 days… and if it hasn't skyrocketed your team to the top of your league's standings, I'll refund your payment with no questions asked. AND - you can still keep everything for FREE! That's an outrageously fair offer don't you think? 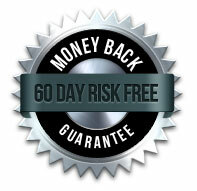 It means you get $256.70 worth of coaching material at no charge, and with no risk whatsoever. But like I said. I will not keep this generous offer open forever. Click the Add to Cart button now to start your 60 day test drive now, and get in on this while you still can!